Country reputation RepTrak study 2017: Nicolas Georges Trad of the Reputation Institute shares key findings and reflects on changes in country reputation over the last years. Nicolas, which findings of the Country RepTrak 2017 study did you find the most intriguing? The very negative impact of Donald Trump’s office on the reputation of the USA. In only months, he has squandered what was achieved by Obama’s administration, placing the country’s reputation at a level similar to the worst Bush government moments. The most alarming setbacks for USA’s reputation are in areas like “is run by an effective government” (-21.6%), “has adopted progressive social and economic policies” (-11.8%) and “ethical country with high transparency and low corruption” (-11.0%). Also intriguing is the uneven impact of Brexit on UK’s reputation; imperceptible in other Anglo-Saxon countries such as USA and Canada, and remarkable – but again unequal, in continental Europe. For instance, in Germany the UK has registered significant reputation losses, but not as much in Spain. The third most intriguing finding is the unequal evolution of the reputation of two powerful countries, Russia and China. While Russia’s international perception continues to worsen (-6,3% in 2017), China’s country reputation has improved for the fourth consecutive year, if only slightly, boosted by its increasingly important role in the resolution of geopolitical conflicts. 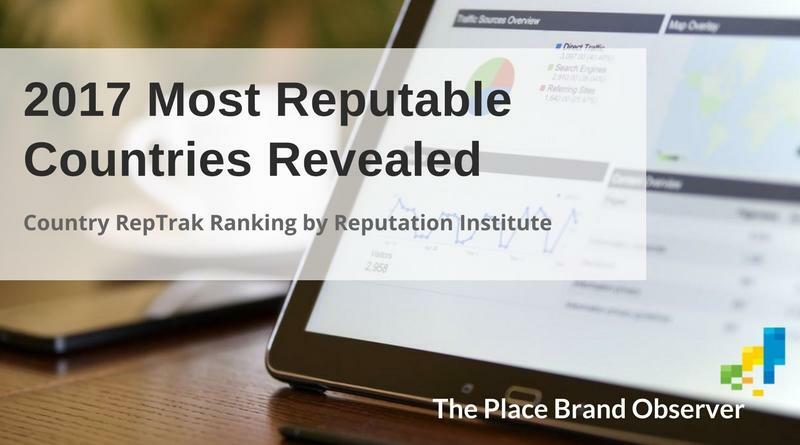 Which countries have seen the strongest increase in brand reputation? Greece, UAE, Egypt and India are the countries that increased their country reputation the most, achieving a growth above 10% when compared to 2016. Greece’s improvement could be explained as a bounce back after several years of downturn on the back of the financial situation they found themselves in. Being no longer in the media spotlight has contributed to this recovery, as well as the accomplishment of their financial commitments after the country’s bailout. USA, Russia and Nigeria are the countries that lost more reputation capital in 2017. The American case could be explained by the Trump Effect. In Russia’s case, geopolitics had a clear influence in the country’s assessment of survey participants, especially those located in nations which have diplomatic and economic disputes with Russia. The significant influence which the personalities of politicians and leaders have on the reputation of their countries (Obama and Trump effects). The remarkable stability of the top ten: during the last five years, nine countries have been always included (Canada, Switzerland, Sweden, Australia, New Zealand, Norway, Finland, Denmark and the Netherlands). Canada’s outstanding performance and dominant position (1st in 2017, 2015, 2013 and 2012; 2nd in 2016 and 2014). The strong influence mass media have on public opinion, as evident with country perceptions of PIGS (Portugal, Italy, Greece and Spain) in the 2013 and 2014 rankings. Since then their reputation has improved to the same level they have been away from media spotlight. The positive effect of consistent country brand strategies in global public perception: the cases of Canada and Switzerland are good examples. Enjoyed this summary of highlights from the Country RepTrak 2017 study by the Reputation Institute? Share and spread the word!